Democratic presidential nominee Barack Obama is entering the third and final presidential debate Wednesday with a wide lead over Republican rival John McCain nationally, a new CBS News/New York Times poll shows. The Obama-Biden ticket now leads the McCain-Palin ticket 53 percent to 39 percent among likely voters, a 14-point margin. One week ago, prior to the Town Hall debate that uncommitted voters saw as a win for Obama, that margin was just three points. Among independents who are likely voters - a group that has swung back and forth between McCain and Obama over the course of the campaign - the Democratic ticket now leads by 18 points. McCain led among independents last week. McCain's campaign strategy may be hurting hurt him: Twenty-one percent of voters say their opinion of the Republican has changed for the worse in the last few weeks. The top two reasons cited for the change of heart are McCain's attacks on Obama and his choice of Sarah Palin as running mate. Obama is widely seen as running the more positive campaign: Sixty-one percent of those surveyed say McCain is spending more time attacking his opponent than explaining what he would do as president. Just 27 percent say the same of Obama. McCain's favorable rating has fallen four points from last week, to 36 percent, and is now lower than his 41 percent unfavorable rating. Obama, by contrast, is now viewed favorably by half of registered voters and unfavorably by just 32 percent. Obama holds a considerable edge over his rival on having the right "personality and temperament" to be president, with 69 percent saying Obama does and 53 percent saying McCain does. The Democratic nominee is also widely seen as more likely to make the right decision on the economy, far and away the top issue for voters, in a survey taken in the immediate aftermath of last week's historic Wall Street losses. Opinions of the candidates could still change, and potential trouble spots remain for Obama, among them the fact that small percentages of voters cite Obama's past associations with Bill Ayers (9 percent) and Reverend Jeremiah Wright (11 percent) as issues that bother them. But with more than four out of five of each candidate's supporters now saying their minds are made up, the poll suggests that McCain faces serious challenges as he looks to close the gap on his Democratic rival in the final three weeks of the campaign. Obama's lead over McCain when it comes to the economy has grown since last week, and a majority of registered voters now say they are not confident in McCain to make the right decisions on economic issues. Thirty-nine percent are not confident in Obama. There is, however, an opening for the candidates in this area: Fewer than one quarter are presently very confident in either Obama or McCain to make the right decisions on the economic crisis. On raising taxes - an area where a Republican nominee might be expected to have an edge - Obama also leads. Despite the McCain campaign's efforts to cast Obama as a tax-raiser, more registered voters say McCain is likely to raise their taxes (51 percent) than say Obama will raise their taxes (46 percent). Voters are almost three times more likely to be very confident in Obama when it comes to health care (28 percent) than McCain (10 percent). A majority of voters, 54 percent, are not confident in McCain to handle health care, while 33 percent are not confident in Obama. McCain continues to be hurt by his perceived ties to the unpopular Republican president, George W. Bush, whose approval rating is 24 percent. More than half of registered voters surveyed say they expect McCain to continue Mr. Bush's economic policies if he is elected. Obama holds a more than 20-point edge when it comes to understanding voters' needs and problems, with 64 percent saying Obama does and 43 percent saying McCain does. The Republican nominee does hold a clear advantage on being seen as prepared to be president, as he has throughout the campaign. That measure does not appear to be boosting his support, however, perhaps because while 64 percent say McCain is prepared for the job, more than half say Obama is as well. Just 7 percent of registered voters say their opinion of McCain has improved recently, while 21 percent say it has gotten worse. The numbers are nearly reversed for Obama: Seventeen percent say their opinion of Obama has improved in recent weeks, while 7 percent say it has declined. 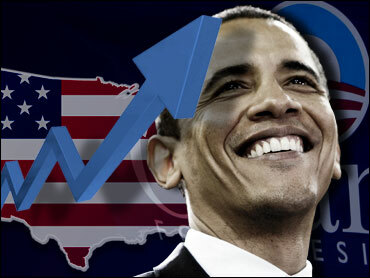 Obama now enjoys leads over McCain with both men (53 percent to 41 percent) and women (52 percent to 37 percent). Eighty-two percent of voters who backed Hillary Clinton in the primaries now say they will back Obama - up from 67 percent last week and the highest number to date. McCain still leads among Republicans, conservatives and white evangelicals, but the race is now roughly even among whites, a group McCain led 54 percent to 39 percent last week. With voter registration up in many key states this year, 63 percent of those casting a ballot for first time in 2008 are backing Obama. Seven in 10 registered voters said they watched last week's presidential debate, and, looking back, 57 percent of debate watchers said Obama won the contest. Just 18 percent saw the debate as a McCain victory. Expectations are high for Obama in Wednesday's third and final debate, which 65 percent of registered voters say they are very likely to watch. Nearly half of all registered voters expect Obama will win the debate, while just 19 percent expect McCain to win. Recently, the McCain campaign has gone after Obama about his relationship with former Weather Underground member Bill Ayers, and McCain has signaled that he will mention Ayers in the debate. One in three voters say they have heard "a lot" about Ayers, and 31 percent say they have heard something about him, though far fewer - 9 percent - say the association bothers them. Four percent of voters say that it bothers them that Obama is a Muslim, which he is not. Fifty-six percent say nothing about Obama's past bothers them. As for the Republican candidate, seven in ten voters say nothing about McCain's past bothers them. Four percent mention the Keating Five scandal that McCain was involved in the late 1980s and early 1990s. A majority of registered voters believe the tone of the 2008 campaign has been about the same as in past years. Thirty percent say it has been more negative, while 15 percent say it has been more positive. Americans have a much higher opinion of the Democratic Party than the Republican Party. A majority - 52 percent - have a favorable opinion of the Democrats, while far less - 37 percent - have a favorable opinion of Republicans. The Democratic Party is seen as more likely than the Republican Party to make the right decision on health care (55 percent to 18 percent), the economy (47 percent to 29 percent), and the war in Iraq (44 percent to 37 percent). And when it comes to the House Of Representatives, 48 percent of likely voters say they will be choosing the Democratic candidate in November, compared to 34 percent who plan to vote for the Republican candidate. This poll was conducted among a random sample of 1070 adults nationwide, including 972 registered voters, interviewed by telephone October 10-13, 2008. Phone numbers were dialed from RDD samples of both standard land-lines and cell phones. The error due to sampling for results based on the entire sample and the sample of registered voters could be plus or minus three percentage points. The error for subgroups is higher.